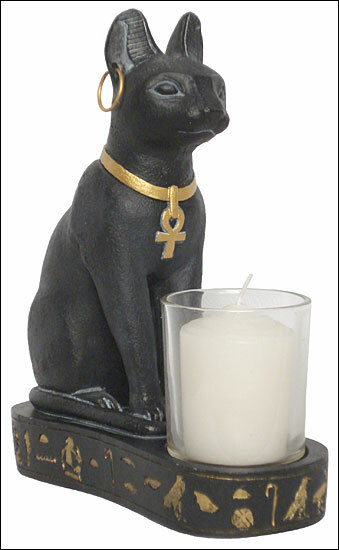 Egyptian cat candle holder, egyptian cats, egyptian statues, egyptian candle holders, candle holders. Cats were sacred to Bastet, a sun goddess who represents the warm, life giving power of the sun. She was known as the goddess of joy and protector of women. She is usually represented as a lion or cat-headed figure. In the New Kingdom, the male cat was regarded as an incarnation of the Sun God and the female cat was equated with the solar eye. Feline figures may display a scarab, the symbol of the rising sun, engraved on the head or breast thus showing their solar significance. Hundreds of figures were set up as votive offerings in the temple of Bastet at Bubastis in order that the donor might share in the Goddess's grace. Actual mummies of cats were buried by the thousands in special cemeteries in the area. Cats protected the temples from snakes. The ancient Egyptians held cats in the highest esteem and the penalties for injuring or killing a cat were very severe.